Heavy red velvet curtains frame the entrance to the small, chapel-like room. It’s only 2:30 p.m., but the four wooden pews are filled almost to capacity. The crowd turns expectantly as a man enters and strides to the front of the room. The “church” is Laws Whiskey House, the man is Alex McGavock, a Laws brand ambassador, and instead of delivering a sermon, he’ll be leading us on a tour of the distillery, culminating in a whiskey tasting. Founded by Alan Laws, the distillery will be celebrating its sixth anniversary in 2017, but the brand has already been making waves in the world of whiskey. Laws is best known for its flagship A.D. Laws Four Grain Straight Bourbon (made from corn, wheat, rye and barley), which earlier this year took home a gold medal in the Non Kentucky Bourbon category at the World Whiskies Awards America, while its Secale Straight Rye Bottled in Bond earned not only “America’s Best Rye” at that competition, but also went on to win “World’s Best Rye” at the World Whiskies Awards overall. 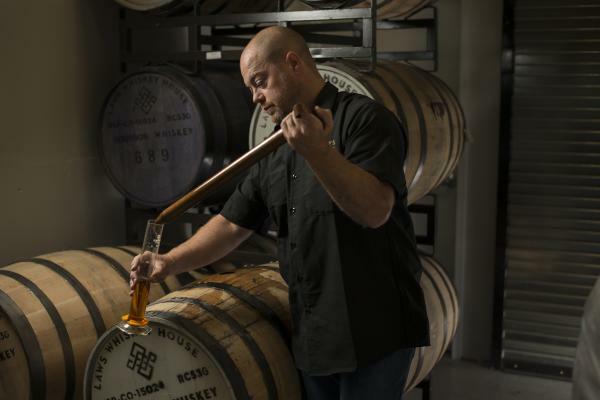 Laws has also set itself apart by becoming the first Colorado distillery to offer Bottled-in-Bond whiskeys, which adhere to some of the strictest distilling standards in America, and the first distillery in the nation to release a Bottled in Bond Four Grain Bourbon. Although quality is paramount, if the distillery has a secondary goal, it’s educating the public. This commitment to education is obvious to anyone who’s been on the tour, which is decidedly in depth. While we sit in the pews, McGavock explains the history of the distillery and gives us a crash course in distilling that spans from grain to bottle. Then we segue into the walking section of the tour.